Take data from sensors in the field and display trends and ongoing system data, e.g. on a simplified system flow path diagram. Provide alarms when sensors indicate abnormal conditions occur, e.g low water or oil pressures in supporting systems. Take data from field sensors and calculate true nuclear power on continual basis (referred to as a calorimetric). This takes into account factors as heat lost by discharging water from the steam generator blowdown system, variation in steam pressure and its effect on steam flow rates. 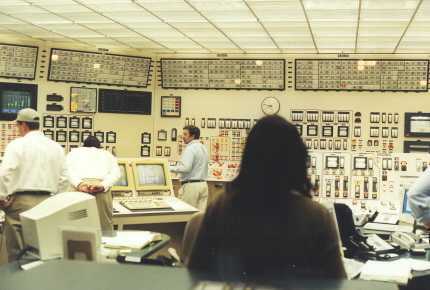 Accumulate data and printout automatically if the reactor shuts down (trips) in order to aid the operators in quickly determining the cause of the shutdown (called a post-trip report). Track all work status (testing and maintenance) at the plant. Track the status of all equipment isolated for maintenance or other reasons. Provide equipment technical information for ~ 150000 components. Provide control of non-safety systems, and some limited safety-related applications at the plant. Such control is similar to that used extensively in fossil power plants. Provide calculations of input from various reactor protection parameters as input to control systems, e.g. control rods. Allow prediction of off-site effects of radiological releases during emergency conditions, if these occur. Input includes local meteorological tower data. Simulation of the performance of plant systems on full scope models of the control room for training and requalifying operations, engineering, and management personnel. Calculations used in nuclear safety analyses, e.g. probabilistic safety assessment and transient and accident analysis. Computers are not usually used in reactor protection applications to shutdown the reactor, except as an alternate to other, usually analog, systems. Because many lines of computer program code are used, the NRC's primary concern is to ensure that such applications could never fail. A limited number of applications of this type have been authorized in U.S. plants.